The Christian Wife Life: A Job I Never Thought I'd Have. A Job I Never Thought I'd Have. If you recall, back in February I got my first full-time job at Johnson Optometric. I worked at the front desk checking people in. I talked a little bit about it back back when I first started working. Welllllll now I actually have a different job! Same place - new position. A while ago they asked me if I had any interest in becoming an optometric technician and I was like yeah, sure. And then it was like BAM, okay, it's time to start training. I was like woahhh, awesome. That's almost exactly how it all happened. So now I've been training for a couple weeks and I have learned SO much. If you've never been to the eye doctor, I'll explain the job this way: I'm the eye doctor's assistant/nurse-like person. If you've been to the eye doctor, I'll tell you that I run all of the preliminary tests on your eyes such as the auto-refractor and visual field test. There may be additional tests/retinal photos needed depending on the patient. I then take you to the exam room and annoy you with a bunch of questions about your health and your eyes and your dog and your life. I check your vision, your eye muscles, your pupils, and then numb your eyes with a drop (everyone's favorite part!). I check your eye pressure, which we do without using the "puff of air" method that people hate, haha. I check your prescription ("One...or two...one...or two") and dilate your eyes. When the doctor comes in I help him with whatever he needs and enter his observations and instructions into the computer system. And all of that is just for a basic eye exam. Some of them are MUCH more complicated. Really every patient is different - that's what's difficult to me. I like having an exact routine and knowing every detail of what I need to do before hand. There's just no way to know that at any doctor's office. It sure does make it interesting though! It helps tremendously that the girl training me is such an expert on all of this and an excellent teacher. I'm surrounded by smart, helpful, kind people at the office and I am SO thankful for that. If you're wondering - yes, I warned them that I am a fainter and get queasy in a matter of two seconds. But they said it should be fine...we'll see. Haha. People have always joked about how I could never have a job in the medical field....but here I am. In scrubs. And also if you're wondering - yes, I have terrible vision myself. My contacts are -6.00 with some crazy astigmatism. (Way beyond legally blind.) So maybe that helps me understand eye problems? Haha. God's plans have definitely taken me by surprise on this one. But He knows best. :) All glory be to His Name! So awesome! Congrats on this new job!! Are you loving it?? I, too, have a job that I never thought I'd have...but that will be a post for this week :) Hope you're doing well! Awesome!! So glad your prayers have been answered and you are surrounded by amazing people doing something so unexpected! Hope you are enjoying it!! Congrats too! how exciting about the new job! congratulations! Isn't it always nice when God just blesses us totally out of the blue?! Ha! That's so funny! I actually do medical billing for the eye department of my company! So I know all about those procedures and tests! And that is something I never thought I'd be doing either! That's so awesome that you love what you're doing and that it was a bit of a surprise! I'm totally praying for something new right now as my work environment is really volatile... believing for something better and it's always encouraging to see God set us up, like He has for you :) so a buncha amens from over here!! Aw! Sweet girl! I'm so glad you're enjoying that job...I know you're doing an amazing job at it! Keep up the good work...those patients are blessed to come in contact with you! Sounds like a great opportunity and a really interesting job! Hopefully the unpredictability will keep the job from getting monotonous! Also, I just wanted to say that I REALLY enjoy reading your blog. I'm glad your husband has been encouraging you to write more because I love reading your posts. Your love for the Lord is so obvious, and it's clearly the central part of your life! Hope you enjoy your job the more you learn about it! Congratulations on the new job opportunity! Congrats on the new position! God really does know us better than we know ourselves, right?! Congrats Ashley! You look awesome in those scrubs girl! What did you study in College? Yea! Congrats on your new job!! Congratulations! I hate eye doctors, but I'm sure I'd feel better if you were my technician! What an exciting time! I'm curious: how do you check eye pressure without the puff of air? Just found you blog. Love it! Congrats on the new job. 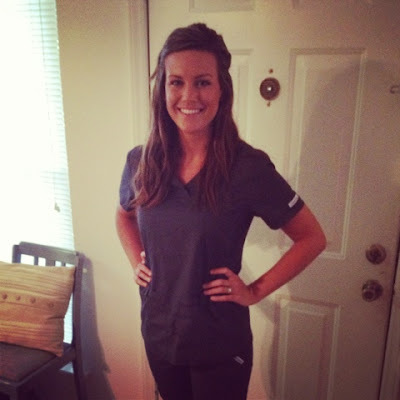 I'd LOVE to wear scrubs every day! :) How comfy! Just found your blog - your heart for the Lord is amazing! 1. I just found your blog. I love it! 2. Your job sounds so cool, I always thought it would be a fun job! 3. Your vision is pretty much as bad as mine! I've never met anyone else with such "special" eyes before. I adore your blog. !!!! WOW!!! From the Office of Ashley Shelley.